Given the large sample-size, this particular bit of research was accepted and for a time it was considered “fact” that cats were completely colorblind. However, cats did have both cones and rods in their eyes, which seemed to fly in the face of the above research. If they have both, why couldn’t cats see color? Enter a more advanced scientific experiment: using electrodes, neurologists wired up a cat’s brain and showed the cat various shades of color. What they found was that the cat’s brain did respond and distinguished between many shades of color. Hence, they could perceive color. In any event, cats are partially colorblind in that they seem to lack the ability to see red, or at least not strongly, but have no problem with blues and greens. So it’s possible that played a role in some of the experiments that seemed to demonstrate that cats couldn’t see colors. After it was discovered that cats could distinguish colors, the “fish” style experiment was run again in the 1960s. This time, it was a success. However, cats never learn this trick very quickly. On average, it took about 1550 tries before each cat would finally learn to pick the colored item to get their treat (presumably at this point they just got tired of the experiment, so started cooperating just to make it all stop). The real leading theory as to why it took so long for cats to learn this is simply that color doesn’t really factor into the daily life of a cat, in terms of being important. Thus, their brains, while able to distinguish between many colors, aren’t really used to doing so, so it takes a long time to train them to do a task like this. This same type of experiment was run on dogs, with much more success (presumably because they long to please you, unlike cats who likely pick incorrectly out of spite). Dogs do have significantly fewer cones than humans, though, so scientists estimate that they only see colors about 1/7th as vibrant as humans do. Despite this, dogs were quickly able to learn to distinguish not only gray from various colors, but also to easily distinguish between many shades of colors. Like cats, though, dogs are partially colorblind. Specifically, due to lack of L-cones they have trouble with differentiating between red, orange, and chartreuse shades, though they can do things like distinguish red and blue and distinguish between the various shades of blue and the like. Long nosed breeds of dogs typically have very wide fields of vision. For certain breeds of dog, this field of vision can be as wide as 270 degrees. Dogs have much better vision when something is moving vs. when it is standing still, being able to distinguish objects as much as twice as far away if it is moving, rather than motionless. Dogs can also visually detect movement 10 to 20 times better than humans, even though dog’s eye-sight is actually not that great overall, compared to humans. For instance, Poodles are estimated to have around 20/75 vision overall. One thing cats and dogs both have a lot of, though, are rods in their eyes, which, among other mechanisms they each have, allow them to see much better than humans in low-light situations. Another common animal/color misconception is that bulls are angered by the color red. In fact, bulls can’t even see the color red as all cows are red/green colorblind. Like dogs and cats, though, bulls are not wholly colorblind. The longest lived domestic cat was named Creme Puff. She lived from August 3, 1967 to August 6, 2005, a span of 38 years and 3 days. This is well over double the normal life span for domestic cats, which is typically around 12-14 years for males and 13-15 years for females. Interestingly, the owner of Creme Puff, Jake Perry, also raised a sphynx cat which was born in 1964 and didn’t die until 1998, a span of 34 years and 2 months. The cat’s name was “Grandpa Rexs Allen”. Why Perry’s two cats lived so long isn’t entirely known, however, he didn’t typically feed them store bought cat food. Rather, he raised them on a variety of “natural” foods; prominent among these foods were: bacon, eggs, asparagus, and broccoli, among other things. This can be a somewhat dangerous practice normally as cats require certain nutrients they won’t always get if they are just eating “human” food. For instance, cats will go blind fairly quickly (and permanently) if they don’t get enough taurine, found in muscle. Cats also require a high amount of protein and calcium. This high amount of protein consumed by cats is thought to be why dogs like cat poop so much, with it being very protein-rich. Cats are thought to have been domesticated around 9000-10,000 years ago. The first known potentially domesticated cat was discovered in a 9,500 year old grave. Both cats and dogs are commonly eaten in certain parts of the world. For instance, in Guangdong, China alone, around 10,000 cats are eaten per day. In all of Asia, it is thought that around 4 million cats are eaten every year, or about just shy of 1% of the world-wide population of domestic cats. Dogs are also commonly eaten in Asia with around 13-16 million dogs eaten every year there, or around nearly 4% of the world’s dog population. It should be noted though that typical breeds you’d find in people’s households as pets are not the ones usually eaten. Rather, specific breeds have been developed for consumption, such as the hugely popular Nureongi dog, which is rarely raised for anything else but livestock and is one of the most popular dog breeds to eat. The nureongi resembles slightly a small yellow Labrador. It was once popularly thought that cats were domesticated by humans in order to provide rodent control. However, it is now thought that they were probably self domesticated in that they simply lived around humans long enough, hunting rodents and other vermin in towns, that certain cats with the predisposition to be friendly to humans gradually became adapted to domesticated life as they scavenged near human settlements. Chocolate is poisonous to both cats and dogs, though cats usually aren’t interested in eating chocolate due to lacking the ability to taste sweet things. This inability is due to a mutant chemoreceptor in their taste buds, which is actually a trait shared by all cats big and small, not just domestic ones. (read why chocolate is poisonous to cats and dogs here) Onions and garlic are also poisonous to cats and dogs, though they can both typically stomach more of these than chocolate, particularly cats. Dogs are also highly allergic to grapes and macadamia nuts. Cats are highly allergic to many common over the counter medications, such as Tylenol and Aspirin. A cat’s forelimbs have a free-floating clavicle bone. Unless they are very overweight, this allows them to fit through any space their head can fit through. A cat’s normal body temperature is around 101.5° F. Unlike humans, they can comfortably withstand high external temperatures ranging up to 126° F to 133° F before showing any signs that they are hot. This is thought to be a remnant of the fact that they were once probably desert animals. Their feces is also typically very dry and their urine highly concentrated so as not to waste water. In fact, cats need so little water that they can survive on nothing but uncooked, fresh meat, with no other water source needed. 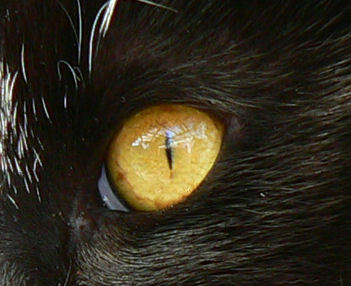 Cats can see quite well in light levels as little as 1/6 of what is required for humans to see normally. They accomplish this largely via a tapetum lucidum, which reflects light passed through the retina back into the eye. They also have exceptionally large pupils for their body size and a much higher density of rods than humans do, as previously stated. Cats also have some of the best hearing of any animal. They can hear frequencies as high as 79 KHz and as low as 55 Hz. For reference, humans hearing range is typically between 31 Hz to 18 KHz and dog’s hearing range is typically between 67 Hz and 44 KHz. This extremely good hearing helps cats hunt rodents in that rodents often communicate in ultrasonic frequencies which the cats can hear. A large percentage of non-albino white cats, particularly those with blue eyes, are deaf. Why this is the case, in terms of what gene is causing it, is not yet known. Cats have exceptional vision when viewing far away objects, but horrible vision when seeing things up close. Specifically, they generally are thought to have around 20/100 vision on objects very close to them. This, along with the fact that cats have a blind spot in front of their nose, is why cats will sometimes appear not to recognize when food is placed right in front of them. Like with the cat, it isn’t known whether the dog was purposefully domesticated by humans or if they were self-domesticated, with certain of the gray wolves becoming friendly with humans from continually scavenging food scraps around human camps. Also, similar to the domestic cat that all likely descended from just a handful of cats, it is thought that all dogs descend from just a handful of gray wolves in a small number of domesticated events. In the dog’s case, this probably took place in East Asia, with the dogs quickly being bred and spreading throughout the world, even to North America around 10,000 years ago. The world record for the smallest adult dog was a 2.5 inch high, 3.7 inch long Yorkshire Terrier. The largest dog on record is an English Mastiff that was 8 feet 2 inches long (around 2.5 meters) and weighed 343 pounds. Dogs are exceptionally good at learning names of objects. The world record holder for this is a Border Collie named Chaser. Chaser’s master purchased 1,022 toys over the course of three years and trained the dog to fetch the toys based on the name. Even after so many toys, Chaser has no problem remember which toy is which, though her trainer eventually had to start labeling them to keep track. Interestingly, a study done in Hungary has recently shown that dogs can judge with remarkable accuracy (about 83%) the size of another dog, solely based on the growl of the dog. Are Cats or Dogs Colorblind? Are Cats Dogs and Bulls Colorblind? @Teresa: Hmmm, there should be no pop-up ads on this website. Must be an advertiser overstepping their bounds. I’ll contact my ad people. In the factoid section at the end of the article, you use “allergic” to describe sensitivities to medications and foods. “Allergic” means something very specific, an immune response. In fact, these animals are not allergic to these things any more than we are allergic to cyanide, but they are poisonous for them. In addition to having difficulties with the color red, cats have a measurably lower cone density in their eyes than humans do, and so will not perceive even the colors that they *CAN* see to be as rich as diverse as humans can perceive them. Cats do have a *far* higher density of rods than humans, which lends itself perfectly to seeing extremely well in very low light conditions. A bull is not a type of cow. Bull refers to a male, cow to female. It should have been expressed “In fact, bulls can’t even see the color red as all cattle are red/green colorblind. ” Maybe for a future article you could find out the singular form of cattle. The very reason I stopped my kid watching Sesame Street! The City Idiots (who thought themselves more educated & intelligent than dumb hick farmers) were teaching children .. boy Cows & girl Cows!!! Do we say boy-woman & girl woman? No! @Luna: “City idiots…” I grew up on a farm in the middle of nowhere (about two hours from anything resembling a city, and even that only loosely). Home town population under 100. I also once worked for someone who raised cattle and one of my best friends in high school was (and still is) a milk farmer. 🙂 Nobody ever cared when you called a male bovine a cow. For a self-claimed “science” site you sure spout a lot of crap. The “cats don’t cooperate because they want to spite you and prove you don’t own them” and “dogs cooperate because they are servile and eager to please” is a lot easier explained by the fact dogs are more intelligent than cats. If a certain color choice gets you fed faster, then it’s a sign of intelligence to learn to pick it, and the animal which can learn this will be more likely to survive than one who refuses to learn out of pique, in many contexts. The whole thing sounds stupid anyway because I seriously doubt the cats have the ability to determine what the humans “want” them to do, any animal would merely be responding to the reward, not the human agency behind it. If they so famously don’t care, why would they react one way or another based on human desires? @Docweasel: It was a joke. It was a joke, yes. Also it’s not so vibrantly clear that dogs are more intelligent. They are more trainable. That does have to do with them being more interested in pleasing humans– this is because they are pack animals and follow a leader, cats are not pack animals and do not follow a leader. This doesn’t mean cats are really spiteful, that’s just a human myth devised for humor. Both dogs and cats become deeply attached to their humans, but dogs are born to recognize hierarchies and cats are not. The case can be made that cats are more intelligent as they have better luck surviving on their own without human care (though they live far longer with human care). Most cats are better independent hunters than most dogs, fueling the argument that cats are smarter. Cats are trainable, but dogs are persistently far more trainable to do many more things, which feeds the argument that dogs are more intelligent. Both animals engage in some independent problems solving when they want or need something. A better and clearer “fact” is that they are different animals, and comparing their intelligence is futile and misleading. Clearly, you’ve never owned both a cat and dog. Cats are, by and large, more intelligent – they just don’t give a crap. That “joke” was actually fairly accurate. I had a white cat with one blue eye and one yellow eye (heterochromia), and she could hear very well with both ears. I read on http://messybeast.com that heterochromic white cats have a “higher chance of deafness” on the blue-eyed side.